For those of us following gaming news so last month we were greeted with the Ouya thank you party. This launch party—or pre-launch party—was for the Kickstarters who chipped in to help Ouya not only reach its goal of $950K in only eight hours, but exceeded it with the campaign managing almost $8.6M by the time the campaign was ended. Needless to say, there was no shortage of support for the gaming console which will run on the Android 4.1 OS and has been promoted with a price tag of just $99 and as the first console that actually welcomes hacking and modding. It’s not surprising that the console has been met with some skepticism with the price tag itself raising red flags of a Kickstarter scam. There were also suspicious glances at the console’s operating system. In an industry where the fandom is largely against mobile gaming, the Ouya came off as simply a $99 mobile phone/console hybrid as it has been expected that it would play games from the PlayStore. In addition to this, Ouya founder and CEO Julie Uhrman has stated several times that the console is meant to bring gaming back to what made it great in the first place, however during an interview at the SXSW Interactive Festival with Joshua Topolsky, fewer details about the console were released with mere weeks to the investor release. There are also some rumblings of potential cheaters in online competitive games due to the openly hackable nature of the Ouya and the annual updating where a new console is released. After more details arose and the announcements of the next Playstation and Xbox consoles hit the newswire, attention was diverted from the implied slights of the Ouya. For every supposed flaw of the console, there have been some bright points that have some Kickstarter investors and pre-order gamers—such as yours truly—looking forward to it. Several indie and big name studio developers have jumped onboard to make titles for the Ouya. Not only that, but anyone who owns the console can make their own games and even sell them on the console’s store and must provide some form of free-to-play whether it is entirely free, free for a few levels, or a demo. This allows for developers to come up with their own methods of generating revenue from games. There will also be a variety of apps such as Twitch.TV, Vevo, OnLive, iHeartRadio, and emulators. A console staple in online multiplayer will be available for some games if the developer chooses to use implement it and the main console is about the size of a soda can with games being saved to Cloud storage. As with any newer console there will be a decent amount of optimism and skepticism. The PS4 and Xbox “720” Durango faced rumors of blocking out retail games and Nintendo keeps its three decades long gloom and doom with their Wii U console. Expect the Ouya out in June for retail. SO emulator, TV, games all for $99. 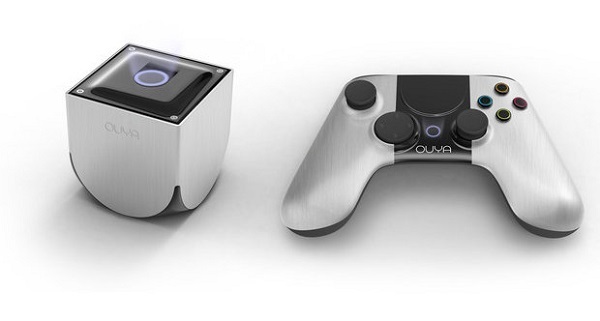 Count me as sold, I knew it was a good idea to add the Ouya to my WIshPlz list. Plus it takes up literally no room. It’s roughly the size of a standard coffee mug or something. You won’t have to find room for it like some consoles which is a minor plus, but a plus none the less.